The National Two North title race was blown wide open in Round 22 as Hull Ionians were dislodged from the summit of the division for the first time since October following their loss to rivals Chester. Jan van Deventer’s side beat the I’s at Hare Lane to move back into the top two, but it is Fylde who are the new league leaders after they defeated Hinckley. The Lancashire outfit are one point clear, but Chester and Hull Ionians both have games in hand with the latter now three points off the top. To add even more spice to the promotion battle, Fylde take on Hull Ionians this coming weekend. 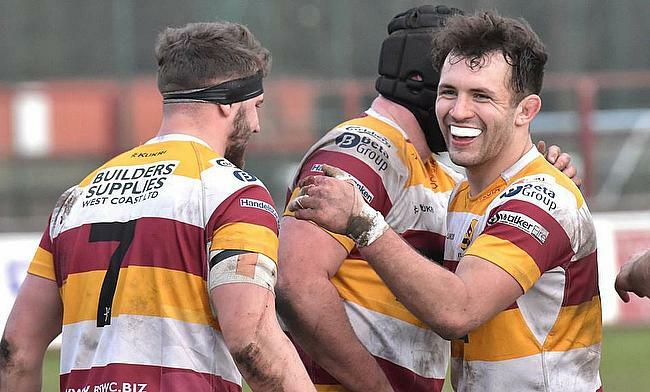 Fellow title challengers Huddersfield also trail Fylde by three points after their win over Peterborough Lions, but Gareth Lewis’ side have two games in hand while Otley kept the leading pack in their sights after beating Sheffield Tigers. Down at the bottom, defeats for South Leicester and Macclesfield have dented their hopes of staying in this division while elsewhere, Tynedale thrashed Sedgley Park and Preston Grasshoppers comfortably beat Leicester Lions. Fylde have moved to the summit of National Two North after a battling win over Hinckley at Woodlands. An early penalty try had given Fylde a platform to work from, but Hinckley were able to go ahead through Matt Lasis’ score and a Joe Wilson penalty. However, Fylde regained the lead just before the break as Connor Wilkinson dotted down and Bevan Rodd’s effort on 51 minutes proved to be enough for the hosts, who are now one point clear at the top. Hull Ionians are no longer top of National Two North after Chester came from behind to beat their promotion rivals. A score by Steve Slingsby and 15 points from centre Lewis Minikin put the visitors on course to remain at the summit of the division. However, Scott Robson added to Craig Ross’ earlier effort to cut Hull’s lead to 10 points and the hosts kicked on in the second period. Colin Campbell and Adam King both scored converted tries to put the home side in the ascendency and Chester didn’t relinquish their lead as they held on for a superb bonus-point victory. Chester are now one point behind Fylde with a game in hand, while Hull Ionians have dropped out of the top two and down to third. Huddersfield are just three points off league leaders Fylde as they comfortably beat bottom side Peterborough Lions at Lockwood Park. Tries from Guy Borrowdale (2), Joe Green and Thomas Hodson meant the bonus-point was in the bag by 43 minutes. Lewis Workman added to that tally, either side of Peterborough Lions scores from Thomas Lewis and Ben Peach, to keep Field in control. Jack Maplesden went over for Huddersfield’s sixth try on 71 minutes, but the Lions did complete proceedings with a consolation score through Christian Edbrooke. The result for Huddersfield keeps them firmly in the promotion race while Peterborough Lions are now 23 points from safety. Otley fought back against Sheffield Tigers to stay on the cusp of the promotion battle in National Two North. Tries by Henri Packard and Ed Simmons helped the Tigers into a 14-12 lead at the break, with Jack Scott-Paul and Joe Graham going over for the hosts. Adam Malthouse gave Otley the lead on 58 minutes and the home side ultimately sealed the win when the ever-reliable Joe Rowntree landed a late penalty. Tynedale ran in eight tries in a dominant victory over Sedgley Park to move up to seventh in the league standings. Morgan Passman kept up his excellent recent form by scoring a hat-trick while Guy Pike, Liam Checksfield, Ben Beaumont, Jonathan Burden and Ben Hutton all crossed for the visitors. Sedge scored four tries through Nathan Rushton, Rob Holloway (2) and Thomas Coe on another tough afternoon for Matt Bebbington’s side. Preston Grasshoppers won their second home game on the spin as they produced a solid display to beat Leicester Lions. James Fitzpatrick’s early effort put the hosts ahead before Thomas Davidson landed a penalty to give Hoppers an ideal start. Edward Leatherbarrow grabbed the second try for a 17-0 lead and Ryan Carlson scored Preston’s third just before half-time. The Lions could not add to the scoreboard after the interval with the only points coming via Leatherbarrow as Paul Arnold’s side moved to within one point of the top half. South Leicester’s survival hopes suffered another setback in Round 22 as they were beaten by Midlands rivals Stourbridge. After early scores from Dan Rundle and Hal Riley, Stour looked like they would surge clear but South reduced the deficit to 12-7 at the break thanks to a Joe Collingham try. However, the visitors did put their foot down following the interval as Rundle completed his hat-trick before Reece Beddows touched down to put Stour 34-7 in front. In the final two minutes, South did manage to score twice through Thomas Cheney and Javiah Pohe but they were just consolations for the home side who are now nine points from safety. Macclesfield’s hopes of staying in National Two North were dented further after losing to Wharfedale at Priory Park. Harry Bullough and Josh Burridge crossed as Dale built a 15-13 half-time lead, with Dan Lomax and Sam Moss going over for the hosts. George Hedgley and Phil Woodhead dotted down after the restart before Bullough grabbed his second score to wrap up the win for the Yorkshire outfit. The Blues failed to trouble the scoreboard in the second period and they were made to pay for their indiscipline as all three of Dale’s tries, following half-time, came after Macc yellow-cards.